While one boxing team left for London to partake in London Boxing International Invitational tournament on Tuesday, another left the capital city of Delhi on Wednesday to participate in the 32nd?International Tammer Tournament, slated to be held from the 24th?to the 27th?of Nov in Tampere, Finland. ?The annual tournament, being held since 1977, has over the years gained worldwide appreciation for the kind of talent and skill that is on display at the event. Almost eighty boxers from 16 countries including England, France, Hungary, India, Portugal, Russia, Scotland, Wales and hosts Finland will take part in the event.?? The 32nd?edition of the tournament will see India making its first appearance with Asian Games silver medallist V Santosh Kumar (64kg), National Games gold medallists M B Lakra (60kg) and Sumit Sangwan (81kg) along with Reigning National Champion Madan Lal (52kg). 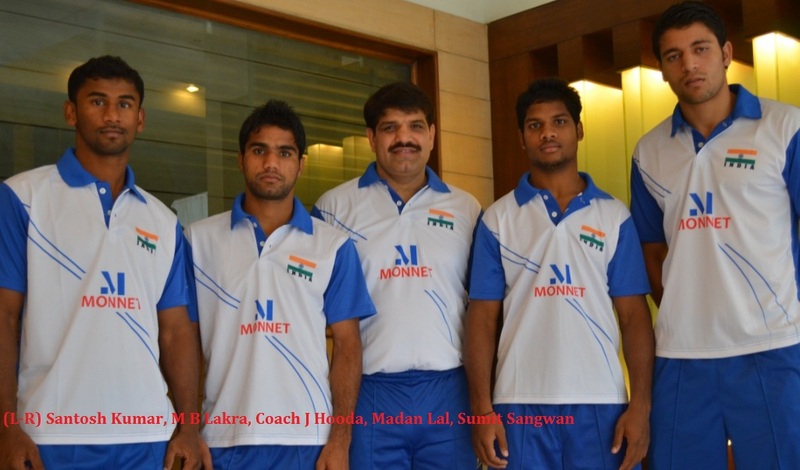 The four Indian pugilists accompanied with Coach Jagdeep Hooda constitute for a young and inexperienced Indian Team. With an idea to provide boxers adequate international exposure and an opportunity to excel at the international arena, the Indian Boxing Federation has decided to field a team for the Tammer Tournament also known as the Tammer Cup.???? ?National Coach GS Sandhu believes participation in these tournaments play a vital role in the development of a boxer as they provided a good deal of exposure and an opportunity to excel and make a name for themselves. He further added,? ?Some of these boxers know that they would not be going to the Olympics (as a qualification has already been achieved in their weight category), therefore it is imperative for these boxers to keep getting match practice and be motivated by performing at such events. It is a twofold strategy that helps the boxers know that they are not just sparring partners and the tables could turn with just one good performance? Reigning National Champion in his weight category Santosh, the most experience of the lot travelling to Finland, would be making his third international appearance this year. The Andhra boxer, who just turned 20 this month, has had a favourable performance with one gold medal from two tournaments (He won the gold in the 21st President?s Cup International Boxing Tournament). With an Olympic berth already having been secured by Commonwealth Games gold medallist Manoj Kumar in his weight division, Santosh keeps himself motivated looking at long term goals. He expressed, ?I am just 20 and there is a long road ahead and I am sure there will be plenty of opportunities along the way. Tournaments like the Tammer cup provide us a platform to rub shoulder with international boxers from around the world and be on top of our game?.